Most of the Tiki glasses you see now at Tiki bars around the world (and some in stores as well) are made by one amazing company: Tiki Farm, Inc. This past weekend was the closing exhibit of Mondo Tiki, an art show at one of our favourite art galleries, La Luz de Jesus; the show was the tribute show to Tiki Farm’s 15th anniversary. I absolutely had to go see it, being a budding fan of Mid-Century Modern (MCM) and tiki and having a small collection of tiki glasses. About 3 minutes after we walked into the gallery, we were asked if we were there for the docent tour. I said, “No, but we are now!” We then stood for about two and a half hours and listened to a couple of the artists talk about their work for the first 30 minutes and then Holden Westland himself, the founder and President of Tiki Farm, Inc., gave us a walk-through of some of the hundreds of glasses on display. It was one of the best things in my life. First of all, I love hearing anyone who is passionate about TTTD (that thing they do) talk about their “thing.” And Holden is charming and lovely and totally geeked out about all of the glasses and the amazing artists he’s worked with. At one point he said to me, “How ya doin? You were even here for this!” and I said, “Oh, I most definitely was here to see your work, I just didn’t know about the tour. I own that Forbidden Island glass in the cabinet right behind you.” He just smiled a big smile. It was an unplanned afternoon and it was superbly splendiforously fantastic. And yes, in the gallery below, there are 3 tiki glasses that were made for USC. Fight On! I was at Downtown Disney the other night and ended up (as always) at the Wonderground Gallery. 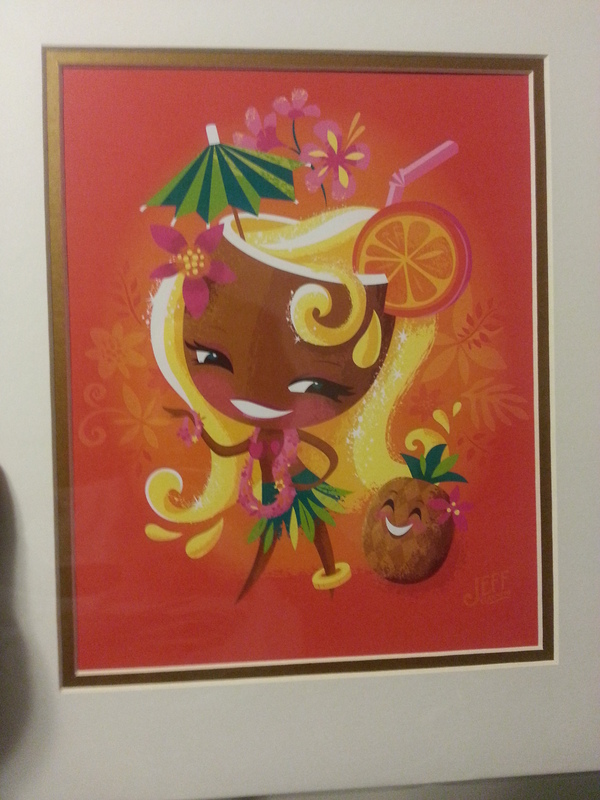 I saw this piece of artwork and absolutely had to have it, as it goes with the tiki theme I’m working on in our kitchen/dining area.